One suspect was arrested for shark theft from the San Antonio Aquarium on Monday, after CCTV footage from the robbery was published on social media on July 28, the same day the 16-inch (40-centimetre) shark called ‘Miss Helen’ was stolen. As seen on the CCTV footage, a man pulls out Miss Helen by her tail, before wrapping her in a blanket, putting her in a child’s stroller, and driving away with what seems like his accomplice in a pick up truck. The two perpetrators have confessed. Miss Helen is a grey horn shark. French President Emmanuel Macron is in hot water after one of his aides, dressed as a police officer, was filmed beating a student demonstrator in Paris. Alexandre Benalla, assistant to the president’s chief of staff, is now under investigation by French prosecutors and could face a slew of charges, including violence by a public official and illegal use of police insignia. The video was taken during the May Day protests and revealed by the French newspaper Le Monde on Wednesday. In the clip, Benalla can be seen dragging a woman down the street, grabbing her by the neck. He then goes back and drags a man along the floor before hitting him. For the first time since becoming president a year ago, Emmanuel Macron is confronting a media and parliamentary campaign, triggered by the “Benalla affair”, which is destabilising both him and his ruling party, The Republic on the March (LRM). Last week, the pressure on Macron, who has refused to speak publicly on the affair, reached a new peak. The affair began on July 19, when Le Monde identified a close collaborator [Deputy Chief of Staff] of the president, Alexandre Benalla, captured on video violently beating demonstrators on May Day in Paris. Violations of normal police procedure have since been tied directly to Macron’s personal security staff and to high-level officials of the Parisian police, notably those tasked with “managing” political demonstrations. Benalla, Fabien Crase—the head of security for LRM—and three top police officials connected to them have been placed under investigation. Benalla was sacked by the Elysée presidential palace on charges of “public violence” the day after Le Monde‘s revelations. Crase was sacked for the same charge. Macron on Tuesday refused to respond publicly after deputies and leaders of political parties requested that he testify before a parliamentary commission of inquiry. Some raised the possibility of impeaching the president, which has never taken place before in the history of the French Republic. The depositions of Interior Minister Gérard Collomb, the prefect of police and the director of public security were damaging to the presidency. The first two refused to take any responsibility and pointed the finger at Macron, and the third contradicted the declarations from the Elysée that the police had authorised Benalla to attend the demonstration. One of the most persistent charges against Macron is that the Elysée is building a parallel police force—essentially an illegal militia—independent of the police apparatus that is normally responsible for the president’s security. Another is that, despite knowing about the events in question starting on May 2, neither the interior ministry nor the presidency alerted the public prosecutor, though they are required to do so by law. The more the Benalla affair exposes the illegal violence of the state apparatus targeting the population, the more aggressively the ruling elite rallies around the police forces. On this episode of Animal Fact Files discover the most simple animal. Summary: All placozoans are superficially identical. But comparative genomic data reveals the presence of different genera. This is the first time that a new animal genus has been defined solely by genomics. Up until quite recently, the animal phylum Placozoa enjoyed a unique position in animal systematics. It was the only phylum to which only a single species had ever been assigned: Trichoplax adhaerens. Now, however, at team led by Professor Gert Wörheide of LMU’s Department of Earth and Environmental Sciences and GeoBio-Center has discovered that placozoan specimens collected from coastal waters off Hong Kong clearly differ from T. adhaerens in their genetic make-up. Indeed, the differences between the two are so striking that the Hong Kong population not only represents a new species but also has been assigned to a new genus — even though the two genera are morphologically indistinguishable. The definition of a new species and genus solely on the basis of comparative genomic data constitutes a new departure in the systematic classification of animals. The findings appear in PLOS Biology. For this reason, he and his colleagues decided to sequence the genome of a placozoan line derived from specimens collected in Hong Kong. Their signature sequences indicated that this line was distantly related to T. adhaerens, whose genome was published in 2008. “Based on comparative genomic analysis, we then developed a novel method for the description of a new species based exclusively on genomic data”, says Michael Eitel, first author of the new study. The researchers refer to this approach as ‘taxogenomics’, which takes into account factors such as structural differences between chromosomes, differences in the total number of genes, and sequence differences between selected protein-coding genes. The genetic and genomic data for the placozoans from Hong Kong revealed such large differences between them and T. adhaerens that they were ultimately assigned not only to a new species, but to a new genus, which represents a higher rank in the hierarchy of biological taxonomy. “This is a completely new departure. It is the first time that a new genus has been erected purely on the basis of genomic data”, Wörheide explains. The new species bears the name Hoilungia hongkongensis. This translates as ‘Hong Kong Sea Dragon’ — which refers to the fact that, just like the Dragon King in Chinese mythology, placozoans can readily alter their shapes. The authors of the new study believe that the placozoans may have undergone a very peculiar mode of evolution, in which speciation has occurred exclusively at the genetic level without notable morphological diversification. “We have some indications that point to the operation of negative selection, so it is possible that the development of morphological novelties may be repressed. But we are still very much at the beginning of the search for an explanation of this unique evolutionary trajectory”, says Eitel. This 24 June 2017 video from Britain is called Arconic knowingly supplied flammable panels for use in Grenfell Tower London. Despite government promises, 297 tower blocks remain wrapped in cladding with an aluminium composite material (ACM). ACM, and the inept manner in which it was attached to the building, was the main factor contributing to the rapacious fire spread at Grenfell Tower, where a small fire breached one flat and within half an hour engulfed the whole building. The role of the cladding in the fire speed and spread was confirmed at the government inquiry begun September 14 last year. The cladding was chosen because it was cheaper than a non-combustible alternative. By contrast, another fire, on July 3, on floor 16 of Whitstable House Tower block in North Kensington—adjacent to the charred remains of Grenfell—was easily contained and doused by firefighters. In this instance, the block was not encased in ACM. Whitstable, despite many other problems, had its original fireproof concrete exterior. In May this year, the Conservative government pledged £400 million to remove ACM from council and housing association blocks. The money is being taken from the Affordable Homes Programme—itself an inadequate government response to the burgeoning UK housing crisis. The 132 private blocks identified as having ACM are a gross underestimation, said Inside Housing. Many buildings have not been tested. In 74 percent of cases, the government has not been informed of remediation plans. Work has begun on only 23 with only 4 decladded. Private sector leaseholders are as concerned as public sector tenants. In many cases, their landlords—the freeholders who own the land where the blocks stand (who may or may not be the original developer)—are demanding flat owners or insurers pay remediation costs. The then-Housing Minister Dominic Raab said “private sector companies should not pass costs onto leaseholders.” At a Westminster meeting, Head of Building Safety Programme Neil O’Connor said the government informed developers by letter that leaseholders should not pay. Even when developers concur, this does not resolve the legal tangle of who foots the bill. Developer Galliard Homes, builder of 1,000 ACM-covered homes in Capital Quay in Greenwich, London, has lodged a claim in the high court against insurer NHBC—hoping the court will rule the insurer pays the £25-£40 million remediation bill. To date, only four developers or insurers have agreed to finance remediation of tower blocks they neglected to make safe in the first place. Developer Barratt eventually agreed to put right the Citiscape block in Croydon, at a cost of £2 million, despite a tribunal ruling that residents should pay. Last November, Legal and General agreed to cover the cost of recladding a 330-home development in Hounslow. Taylor Wimpey has agreed to pay for safety work at a development in Glasgow Harbour. Developer Mace confirmed it would finance the recladding on its £225 million Greenwich Square project in London. A property tribunal recently decided in favour of property giant Pemberstone against the residents of private blocks Vallea Court and Cypress Place, in the Green Quarter of Manchester. The 345 flats were built in 2013 by international conglomerate Lendlease. Lendlease sold the freehold on to Pemberstone, which receives leasehold payments from the flat owners. The tribunal ordered the residents to pay £3 million for recladding, fire patrols and Pemberstone’s legal fees, through a hike in their annual service charge. Many residents bought their homes under the government’s help-to-buy scheme. They represented themselves at the tribunal after crowd-funding raised £11,000 for legal advice. Residents were also enraged to learn that Manchester’s Labour-led council is considering awarding Lendlease a £190 million contract to refurbish the city’s historic town hall. Residents whose lives are at risk are growing angry. 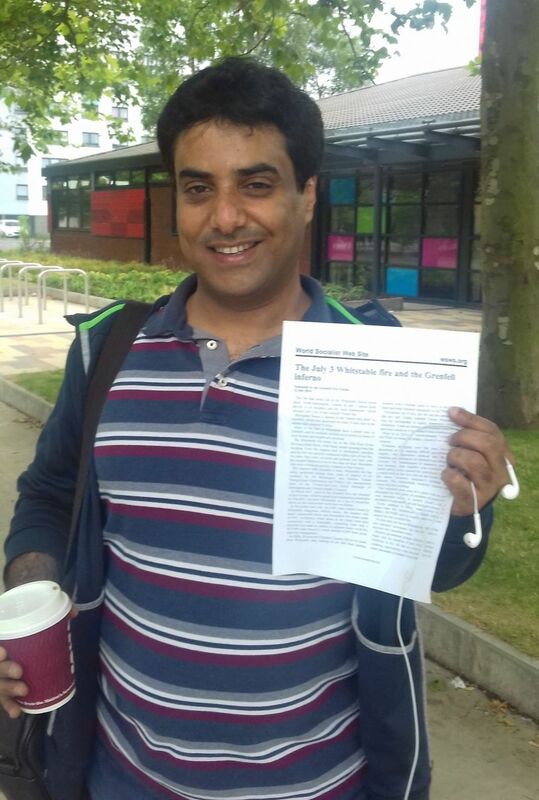 The WSWS spoke to council tenants in Salford, north west England. 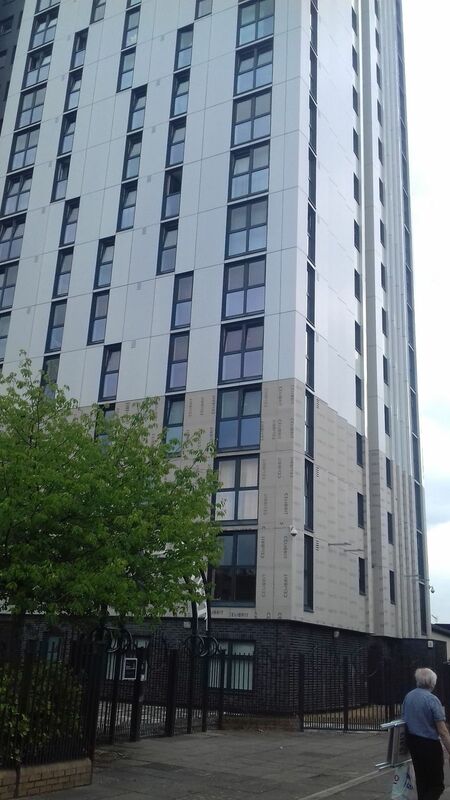 In Salford, there are 29 blocks covered with ACM cladding—the highest concentration in the UK. Labour-run Salford City Council, led by Mayor Paul Dennett … runs nine blocks via management company Pendleton Together. The other 20 blocks with flammable cladding used to be council-run but are now owned by housing associations Salix Homes and City West Housing Trust. Last August, the council announced it was borrowing £25 million to declad its nine blocks. To date, most of the council flats are like Spruce Court—with cladding removed from the first three floors but no remedial work done. Marlene, from Malus Court, complained about the lack of information from the council or freeholders. “They’re not telling us anything,” she said. 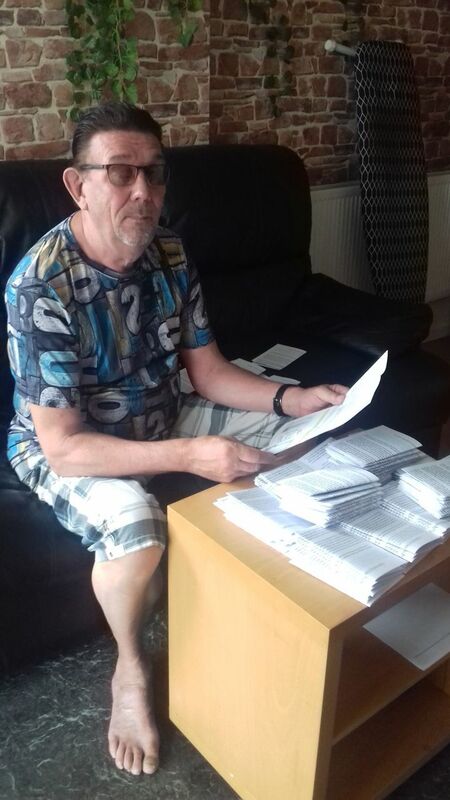 Jon Smith, who is 72, has been an active campaigner for the removal of flammable cladding since the Grenfell fire. WSWS reporters spoke with him at his flat on the sixth floor of Thorn Court. As to the council’s promises to remove the cladding over the next two years, Jon said, “Two years is rubbish,” pointing out the slow pace of the work. “How’s it going to take two years with nine blocks. It’s a disaster! I’m going to sit outside Brotherton House [Pendleton Together] with a petition. We want this [cladding] removed now, the windows replaced and the electrics checked. 420 million years ago, some fish were more medieval. They wore armor, sometimes made of big plates, and sometimes made of interlocking scales. But that armor may actually have served a totally different purpose, one that many animals still use today. LGBTQ protestors blocked off the streets of Tel Aviv to protest what they say was a stab in the back by Prime Minister Benjamin Netanyahu. A massive political demonstration snowballed from a fringe issue: surrogacy. It quickly became a rallying cry for equal rights. Our Ariel Levin-Waldman has the story. Homophobia by religious right Protestants and religious right Roman Catholics is well-known. At least in the 1960s, it also existed among secular ‘liberals’. It still exists in Middle East absolute monarchies claiming to base themselves on Islam. It still exists among the Hindu religious right in India. It still exists among the Japanese Shinto religious right. Etc. More than 200 leading rabbis published a letter condemning the idea of surrogacy and adoption for gays, describing homosexuals as “perverts”, The Jerusalem Post reported. These rabbis, the Jerusalem Post writes, are ‘from the national-religious sector‘. The construction of a luxury hotel in Montenegro’s Ulcinj Salina threatens the local economy and thousands of birds who depend on this resting and breeding site. Give nature and people a voice, sign this petition to protect Ulcinj Salina: https://savesalina.net. Share widely to #SaveSalina! The #SaveSalina campaign aims at the protection of Ulcinj Salina in southern Montenegro. The salina is a nearly 15 km² large wetland area, which serves thousands of birds as resting and breeding site. Since 1935 salt was produced in Ulcinj Salina in a nature-friendly way, which benefited both migrating birds and local people. However, the salt harvest stopped in 2013 and since then initiatives exist to sell Ulcinj Salina and build a luxury hotel resort on the land. Although the Government of Montenegro is aware about the importance of Ulcinj Salina for the local economy and the international bird migration, it did not show any interest in protecting the site and preventing its degradation. In order to give nature and people a voice, the international campaign #SaveSalina was set up. With international pressure we have a strong tool to push the government to act!